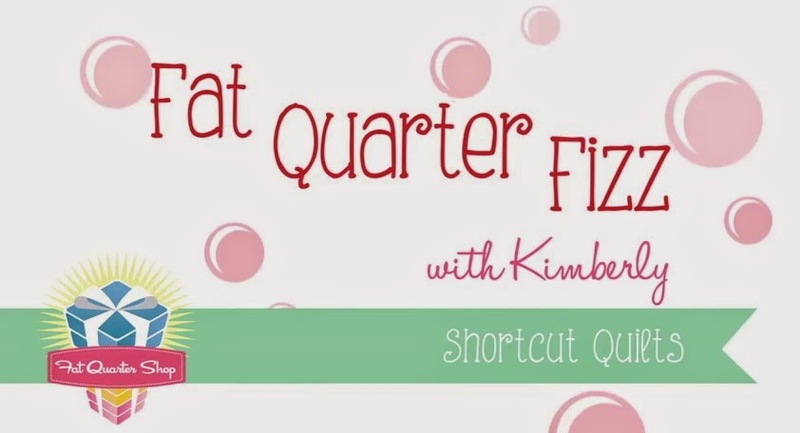 Happy Quilting: Fat Quarter Fizz!! I was super lucky and got to make 2 quilts from this fabulous shortcut pattern. The first one I was asked by Fat Quarter Shop to make so they could use it as a sample. This quilt features the fabulous 25th and Pine by BasicGrey for Moda. I just love Christmas quilts!!! Seriously, I don't think I will ever have to many Christmas quilts. 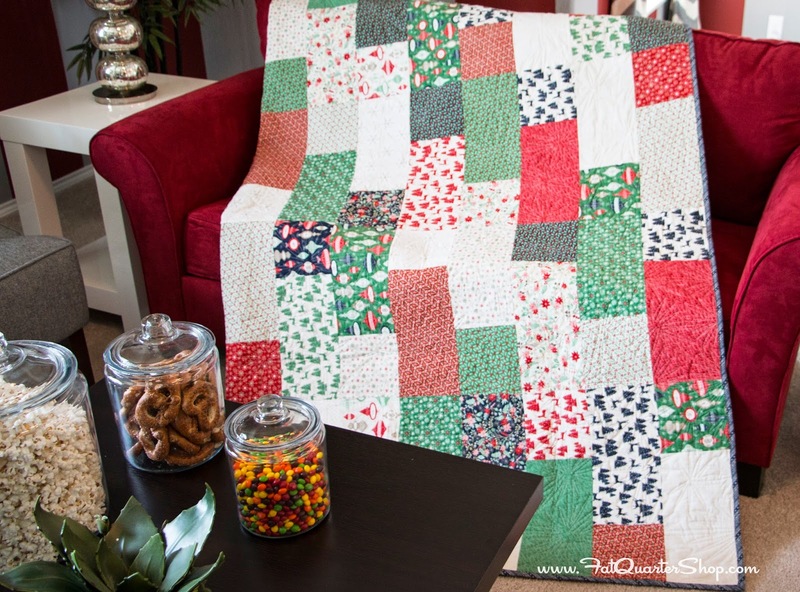 And this quilt is the perfect size to snuggle up in front of a fire with measuring 60" x 72". This quilt really is a shortcut quilt!! It goes together super fast, is super easy, and all around, just a good time to make!! It really is perfect "go-to" quilt!! Which is what gave me the idea for my next quilt. The lovely gals at Fat Quarter Shop asked me if I wanted to make my own version of Fat Quarter Fizz using a fabric of my choice. I immediately thought of how perfect this would be for a friends wedding that I have right around the corner. And what could be more beautiful for a wedding than the gorgeous Up Parasol by Heather Bailey for Free Spirit Fabrics!! I decided that rather than splitting the fabrics by lights and darks to split them by color palette. So the greens and blues make a diagonal row and the pinks and oranges make the other diagonal row. I love how it turned out. You can still see the diagonal pattern, but it also has such a beautiful blend and flow. When it came time to quilt, I opted for one of my new favorites, the quilted swirl. Isn't it so funny, a few weeks ago I was scared to death to quilt this, and now it is a favorite ;) I used my new favorite #402 Pearl So Fine #50 Superior Thread to quilt it up. Seriously, that color blends so perfectly!! I love the 25th and Pine fabrics, but I really love the one you did with Up Parasol even better! Both are lovely and your quilting choices are perfect!! Melissa, is there a pantogram for that quilting pattern? My daughter has access to a longarm now, and I love it! Hi Melissa - This is an omen from the quilting goddesses! I was over at the Fat Quarter Shop looking at the video for this quilt JUST before opening your email. Something tells me this quilt is going on my "to do list" in short order. I really like the way you defined your blocks by color groups, rather than darks and lights. Thank you for the great idea! Gorgeous quilting and love both versions! They both look lovely, and I love that quilted swirl too!! And I switched to following you on bloglovin and am getting your posts now!! Yeah!! Love the layout of colors! Oh my gosh! I love them both! Just wondering if you paired up you pinks/oranges and blues/greens for sewing together to get this effect? Not sure I posed that question quite right. I love this quilt and have all the fat quarters necessary for it right now. I can't wait to make it. Looking at the first picture of this color version I see how you paired them! Both quilts are so pretty, and I love seeing the two different quilting patterns! Love the Up Parasol!! Beautiful! I have a quick question, do you prewash your fat quarters?